Egg Salad + The Easiest Way To Peel Eggs! 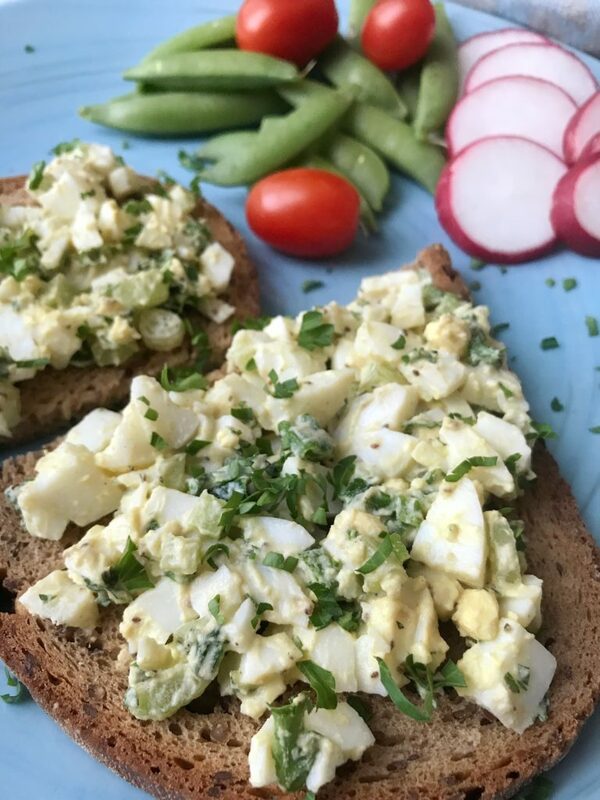 Making an egg salad is one of the best ways to use up eggs and to pack some protein into your meals. I often find myself with eggs about to expire, either because I didn’t get around to baking or because my kids didn’t ask for scrambled eggs breakfasts. When eggs ‘pile up’ in the fridge, I boil a dozen and make an egg salad. 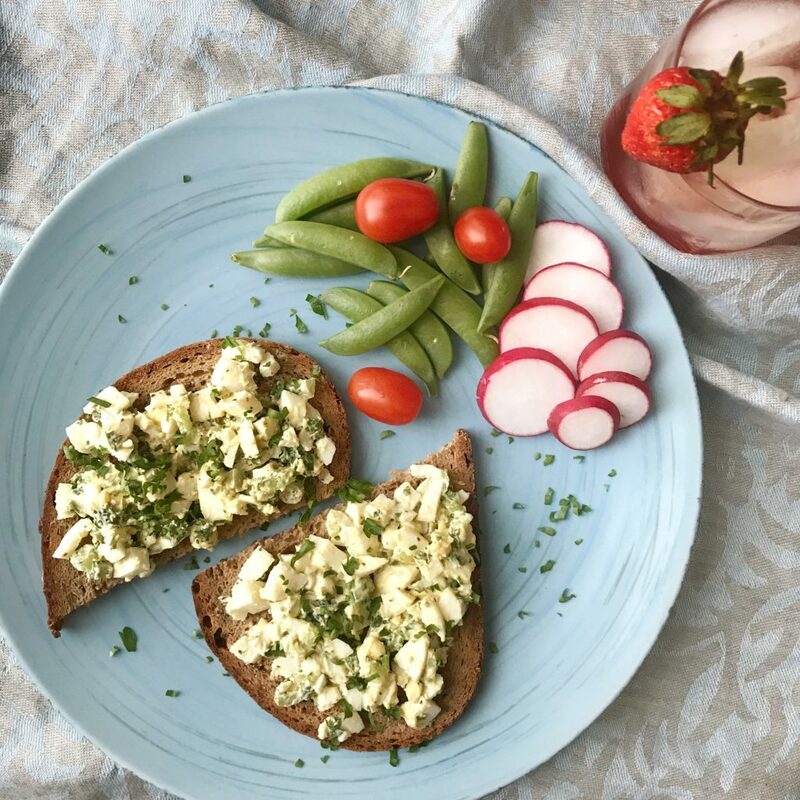 We eat the egg salad for dinner and have leftovers for breakfast on toast, or as a snack. 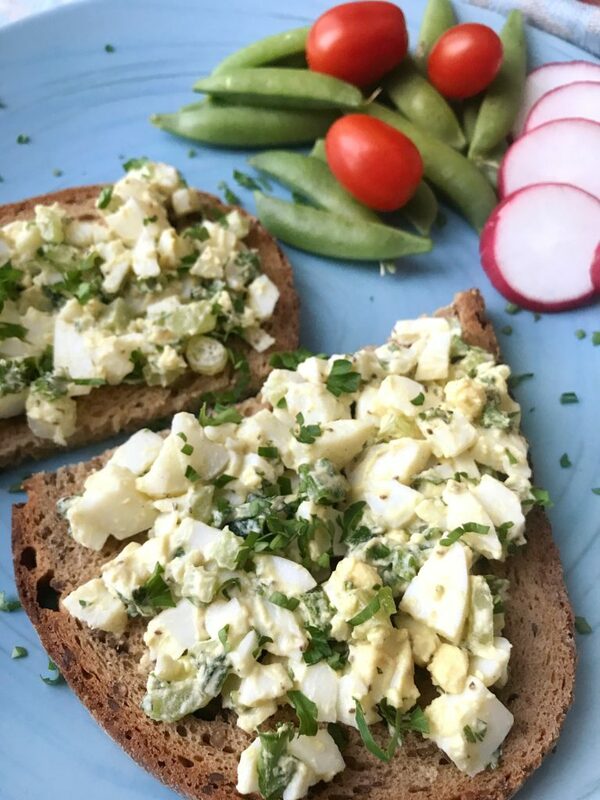 There are so many ways to make egg salad! I’ve seen the simplest of recipes, like eggs mashed with a fork, with added salt and pepper. And, I’ve seen eggs dressed with lots of mayonnaise, and egg salads made with curry powder. In our house, we like our egg salad with celery, green onions, whole celery seeds, mayonnaise, and dijon mustard. I usually use 6 whole boiled eggs, and 6 boiled egg whites. The reason I don’t use all 12 yolks is because I want to cut down on the taste of too many yolks as well as cut down the cholesterol levels. Adding dijon mustard to the egg salad adds a slight bit of heat to the salad, and using celery seeds adds some crunch and a bit of heat as well. I use just a small amount of mayonnaise to let the taste of the eggs shine through. 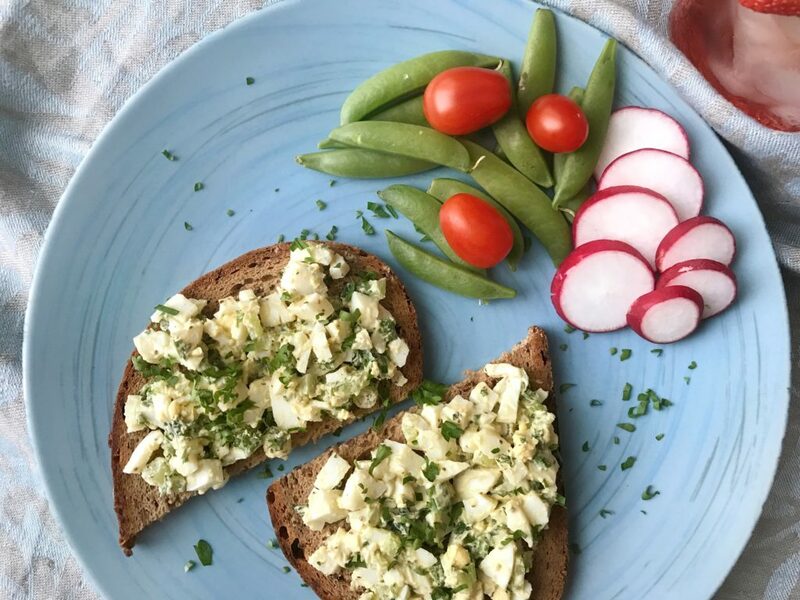 One trick to making this egg salad is to boil the eggs and wash the vegetables in advance. Because there’s a lot of chopping involved, I find it easier to have all the ingredients prepared in advance. Then, on the day I want to serve this egg salad, I chop everything up and make the salad. It’s more fresh that way. One of the things I’ve heard people mention is how frustrated they are when it comes to peeling boiled eggs. I’ve tried many methods over the years, but I recently learned how to peel eggs in the most efficient fashion! I learned this trick by watching a busy restaurant server prepare take-out orders. Here’s the server’s trick for peeling a boiled egg: take the egg and bang it on a plate with enough force to crack the shell. Without lifting the egg and using pressure, roll the egg back and forth enough to crack the egg shell all the way around. Then start peeling the egg: the peel should come off easily! Here’s a video I made on how to peel an egg. And, here’s the recipe for my egg salad. Place the chopped eggs in a large bowl, and add all the other ingredients. So, how do you make your egg salad? There are so many variations! 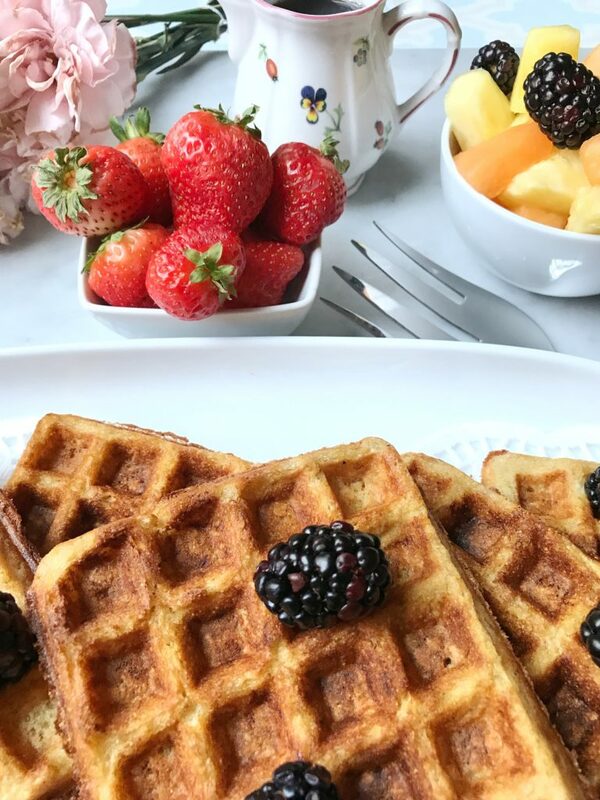 My love for waffles is never-ending, and these Cornmeal Banana Oatmeal Waffles are my latest creation! (You can also check out the recipe for my Strawberry Banana Waffles). I often have waffles more than once a day. If it’s not for breakfast, it’s as the base for a savory lunch waffle sandwich. Lately, I’ve been looking for ways to add fiber and protein to my diet. When I saw that 1 cup of yellow corn meal contains about 9 grams of fiber and about 10 grams of protein, I got very excited. I spent some time subbing out part of the flout for cornmeal, and came up with this recipe. Cornmeal gives food a crunchy texture that you either like or you don’t. I’m a huge fan of cornbread as well as any Middle Eastern desserts that contain semolina or cream of wheat. The texture is satisfying for me. So, I didn’t need much convincing to make these waffles part of my weekly meal prep. I make these cornmeal waffles, store them in the fridge, and toast them for meals. Although photos on my blog and Instagram include syrup, I rarely eat the waffles with syrup. Syrup is for extra special occasions! 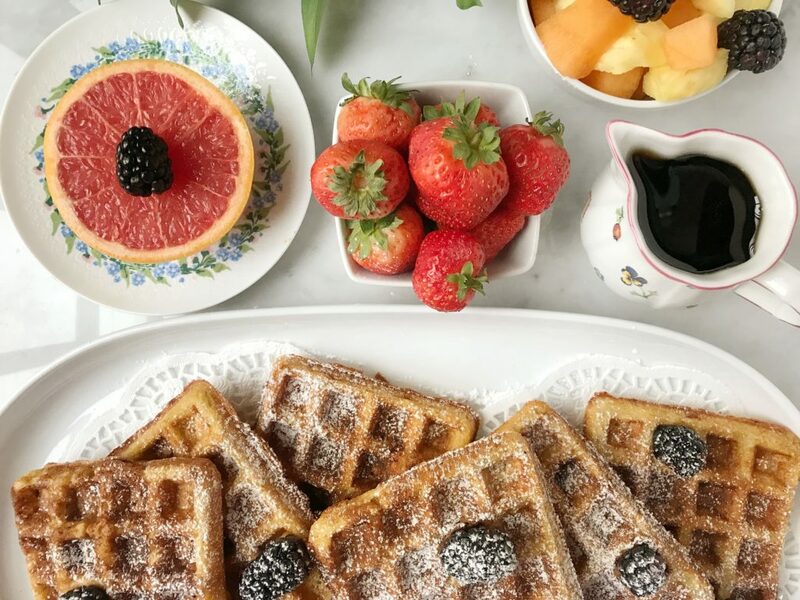 I usually eat my waffles plain, like a piece of toast, and add fruits when I have time. 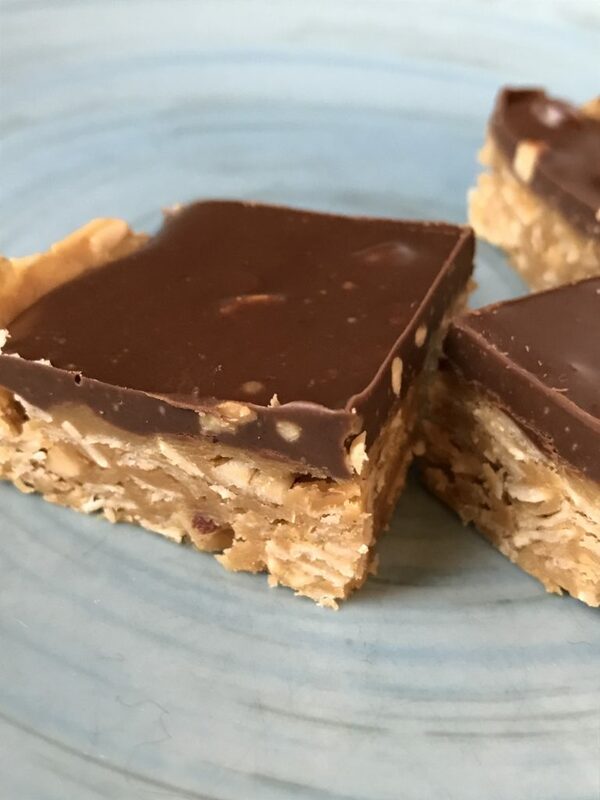 I’m kind of addicted to freezer fudge these days, and for good reason: it’s easy and quick to make, there’s no cooking required, and it’s a satisfying treat. There’s something about having a cold snack/treat that makes it that much more tasty. I have a few other fudge recipes that I’ve also developed, and I will be sharing them with you over the next few months. In the past, I’ve made tahini freezer fudge, and the recipe is on the blog, here. The main ingredient in freezer fudge is coconut oil, which helps the fudge set. 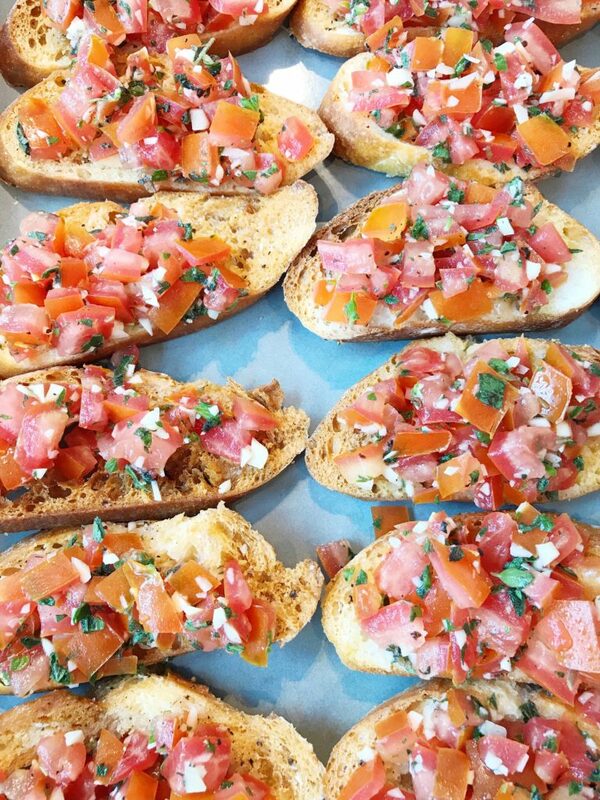 This fall I attended an event at the Miele Experience Centre in Vaughan, Ontario, where the Miele chefs gave us many kitchen tips and taught us how to make delicious, classic dishes, like tomato bruschetta. The event was part of the Kitchen Stuff Plus and Henckels & Staub combined product knowledge day on the functions of the various knife offerings. Making bruschetta using the sharpest and most appropriate knives for the job was an absolute delight. 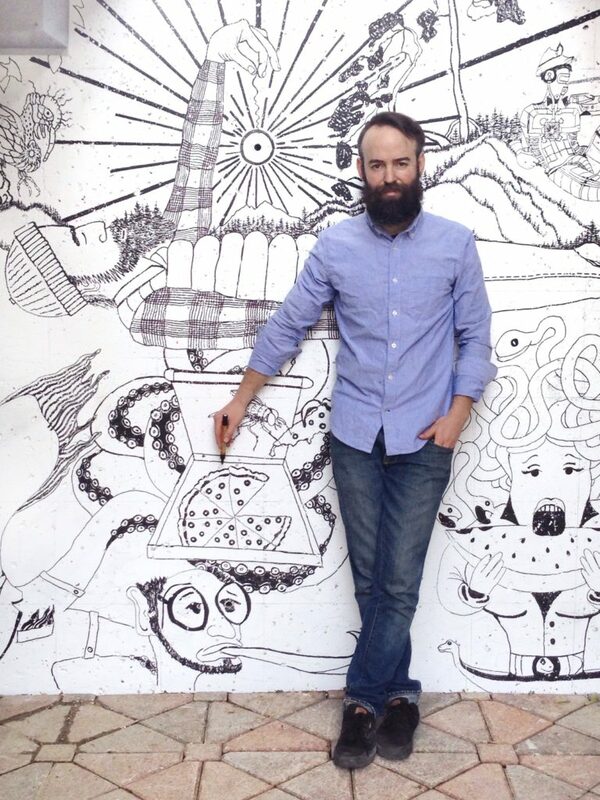 Have you ever walked or driven by street art and wondered how it all came to be? Well, in Toronto, we’re lucky to be surrounded by lots of intentional, thoughtful street art – and each installation comes with a story. 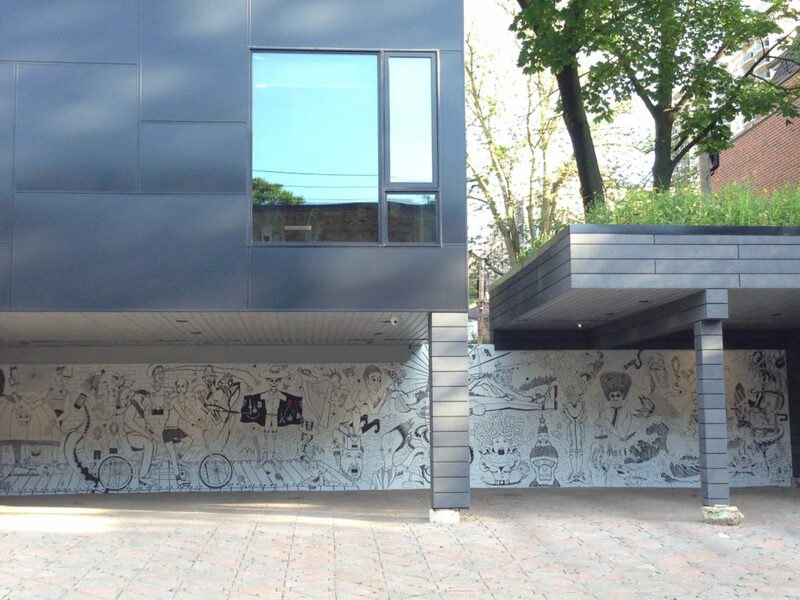 The Forest Hill Village is the home to ‘Go Swimming’, a 6 by 40 foot black and white mural behind the building at the southwest corner of Montclair and Spadina in Toronto. The self-taught artist, James C. Jennings, and his friend were in the Village last fall, admiring the building. The owner, Lorne Rose, overheard them and the they soon began discussing how to turn the blank garage wall into a piece of art for neighbours and passersby to enjoy. The request was simple: a positive, whimsical, cartoonish piece that would make people stop, engage, and smile. And, it does just that! Ultimately, this mural represents three things: community art, created with humour and meaning, about the world we live in today. 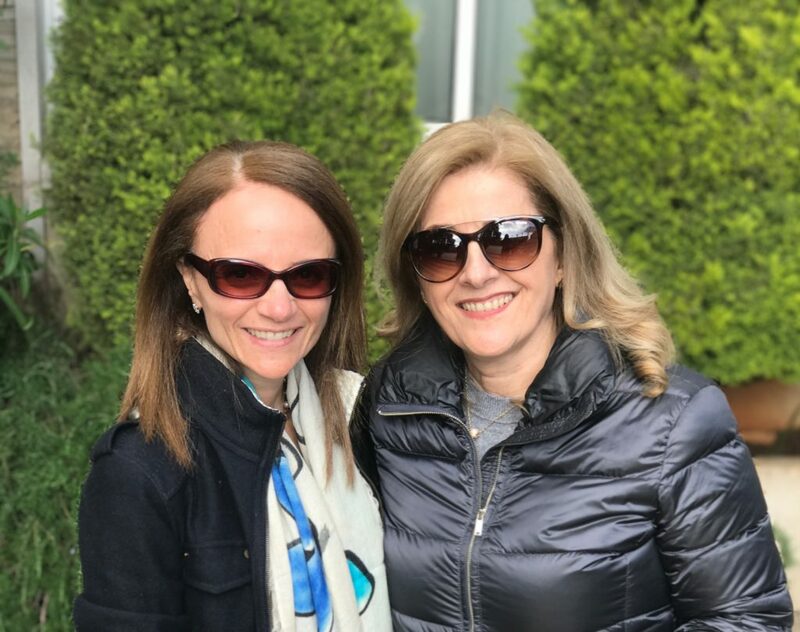 When I was blessed to become a mother, it didn’t take long to appreciate the built-in community that comes with motherhood. 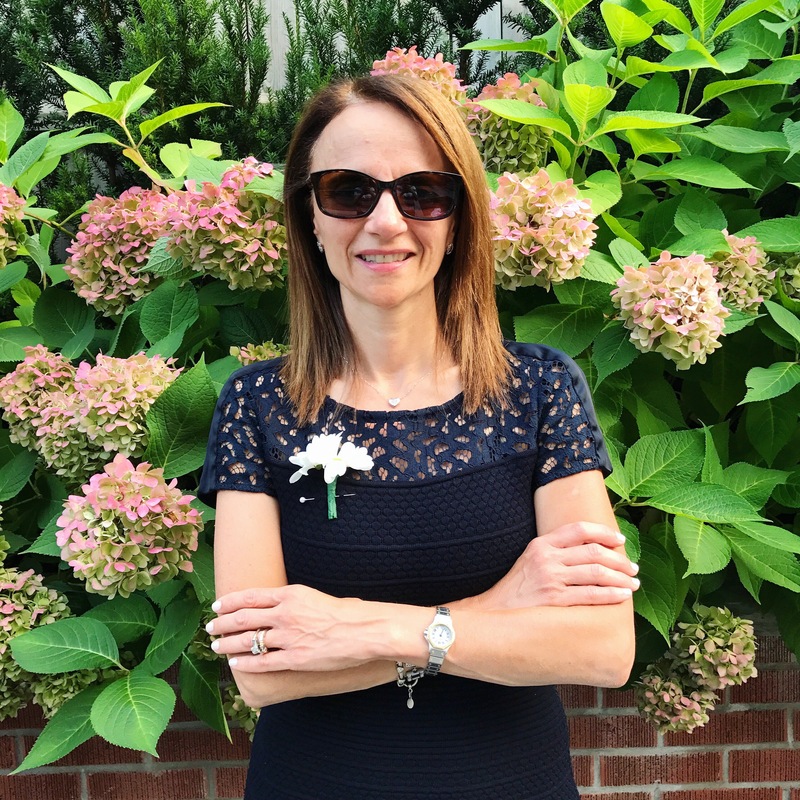 The first place I met other mothers was at my local library where our public health nurse taught us how to care for our newborns and where I heard how other mothers were coping. These mothers made me feel normal and not alone. 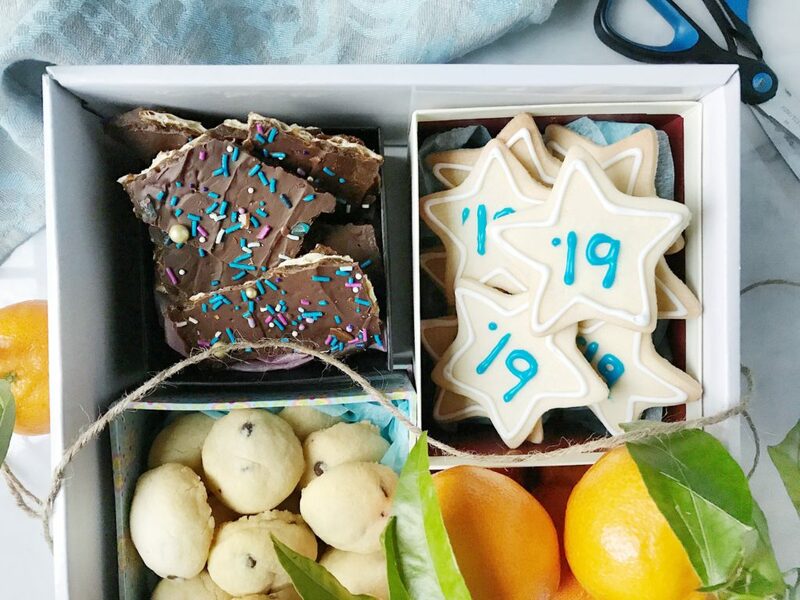 How To Assemble A Stunning Cookie Box ! As much as I love to bake, I also love the creative process of packaging said baked goods — and, nothing does it better than a cookie box! 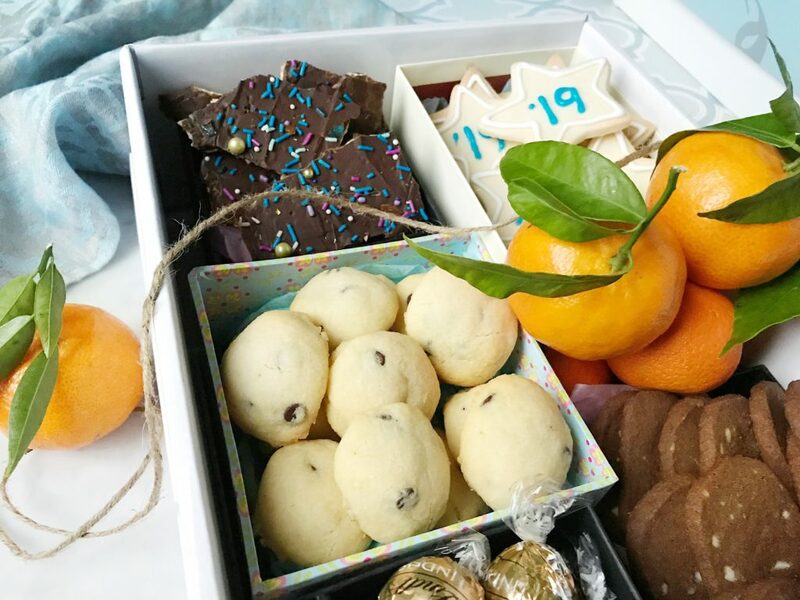 Cookie boxes have been around for a long time, including old-fashioned tin boxes, cardboard bakery boxes, holiday-themed boxes, and basically any container you can get your hands on. But, have you ever assembled a cookie box that contains separate compartments for cookies and other treats? They’re so easy and fun to put together, and the presentation can be quite spectacular. You just have to check Instagram and Pinterest for inspiration! 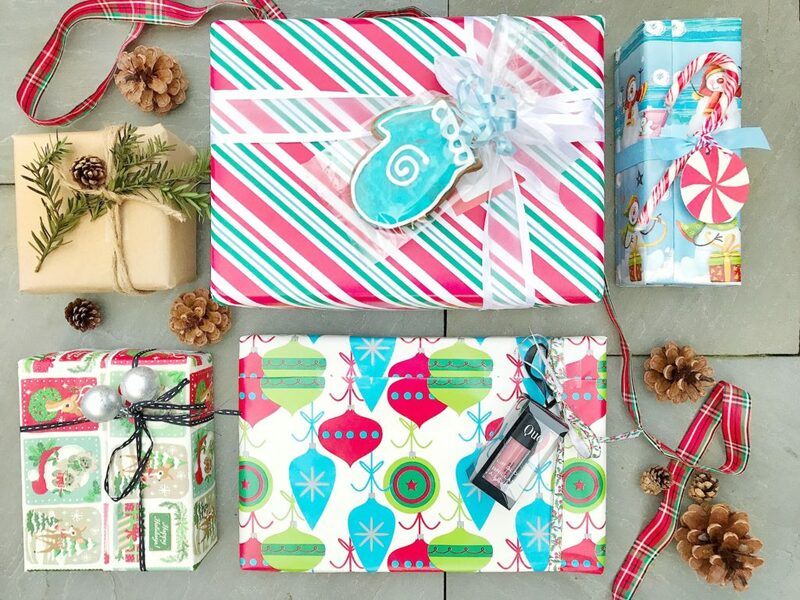 I don’t know about you, but I love wrapping gifts! I’ve loved the process of figuring out how much paper to use and in which direction to cut it since I was a kid. I love finding matching ribbons and twirling them with scissors. And, I love finding the perfect topper for each gift. When gift bags were invented, it was not a trend I liked at all! My love for wrapping gifts started the Christmas I was in 3rd Grade, when I was asked to help wrap about 300 Snoopy stuffed animals that would be given to kids visiting Santa, in the American compound in Saudi Arabia where I grew up. I think there were about five of us and we had so much fun doing it. Every time I wrap a Christmas gift, I think of wrapping those Snoopy dolls. I’m always impressed with how much effort goes into wrapping a gift by many people. Magazines are full of fancy and simple and creative ideas. The final pieces are works of art and so beautiful. 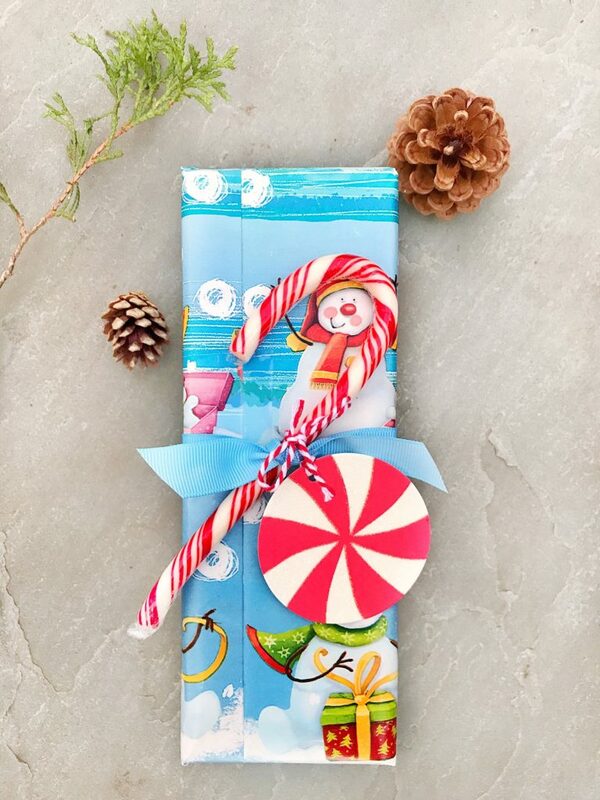 One day, when I have a lot more time on my hands, I would like to wrap a gift like they do in magazines! In the mean time, though, I’m totally old school and use old-fashioned printed wrapping paper and ribbon. 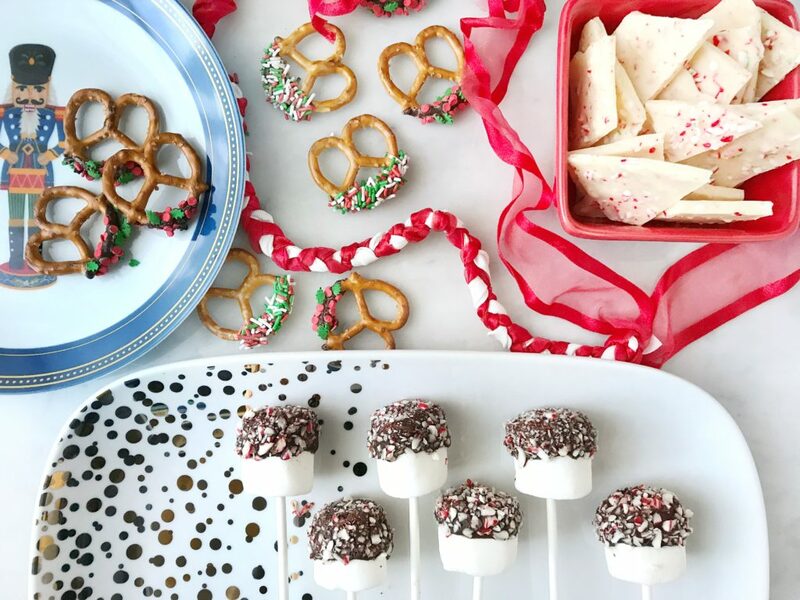 3 Last Minute Chocolate Christmas Treats – No Baking Required! 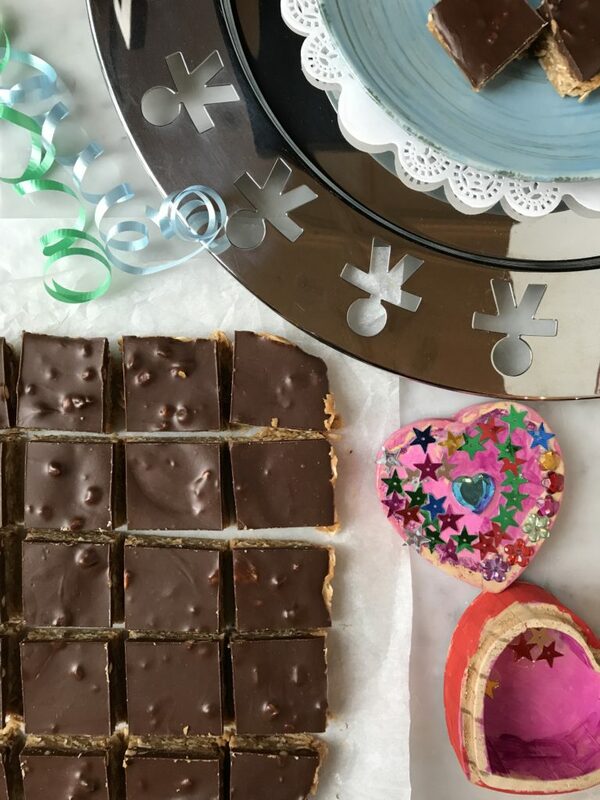 If you’re looking for some last-minute Christmas treats, here are three colourful ideas, all no-bake, made with chocolate. These sweets are so simple…you don’t even need a recipe to make them! You may have seen chocolate dipped marshmallows in stores – they are usually made with jumbo marshmallows. 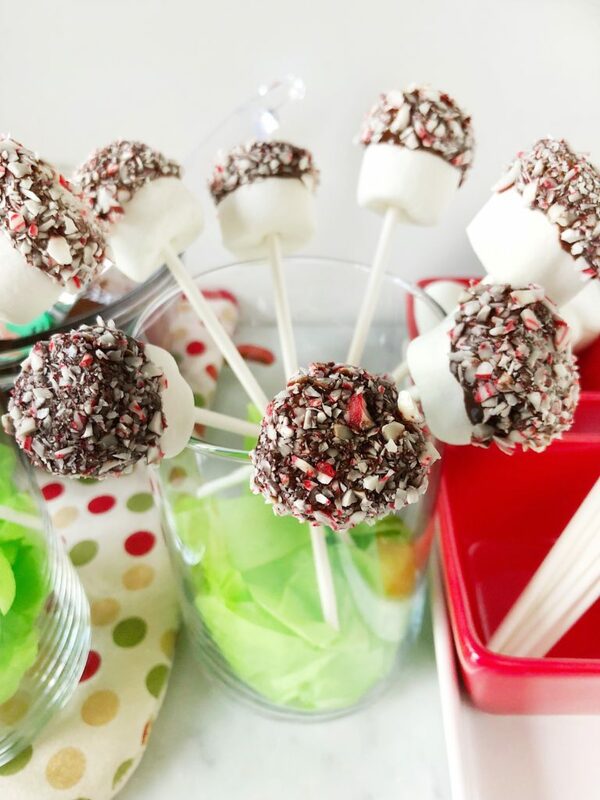 They’re dipped in chocolate and embellished with crushed candy canes, sprinkles, and any other candy you can think of. And, they come wrapped in clear cellophane and tied with a ribbon. 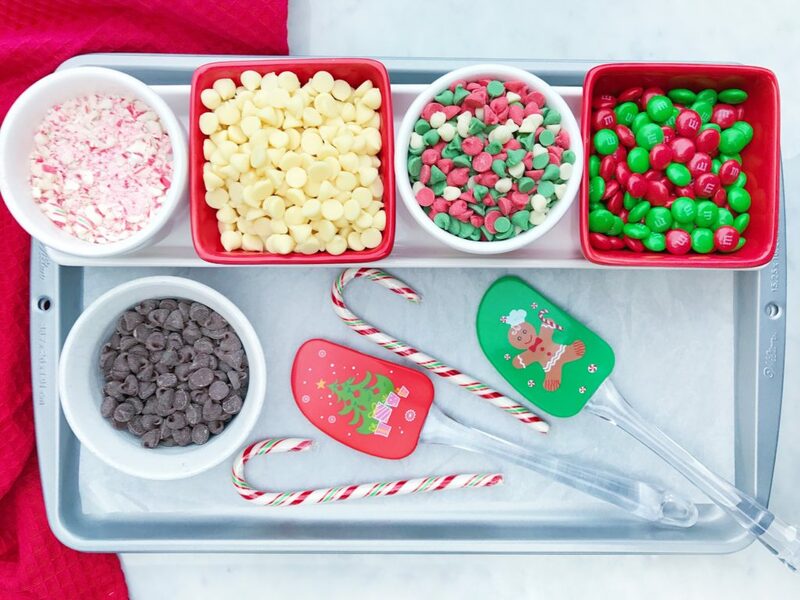 3 Easy Tricks To Turn Chocolate Chip Cookies Into Christmas Cookies! Every year, I get a head start on my Christmas baking by taking my go-to chocolate chip cookie recipe and changing the mix-ins to create a variety of holiday cookies. 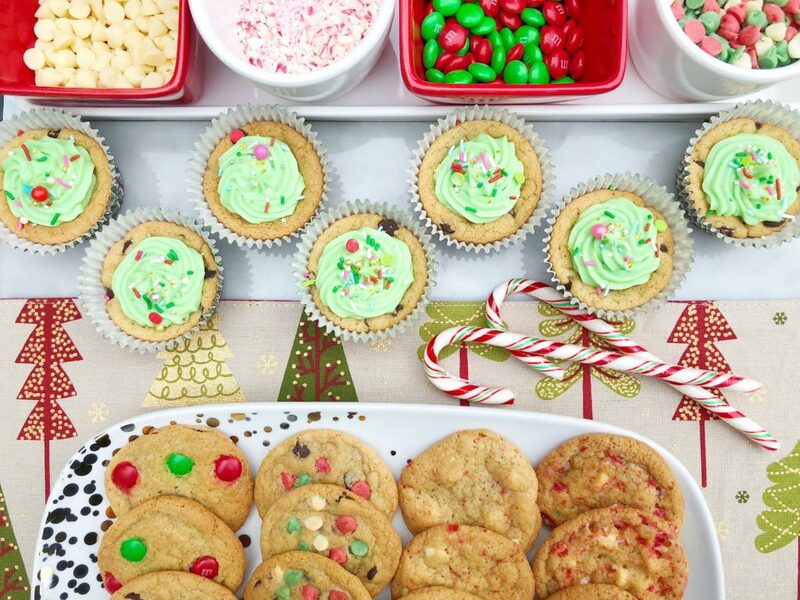 It’s an easy way to make festive treats out of a basic recipe! Before getting started, I make sure to have fresh baking soda and vanilla on hand. I also check the state of my baking pans and mixing bowls and replace any that need upgrading. I love the Wilton pans, spatulas, and glass bowls that I picked up at Kitchen Stuff Plus recently. Visit your local bulk food store to purchase some fun mix-ins available during the holiday season. I’ve included the recipe I use for making chocolate chip cookies at the end of this post.